For entrepreneurs and small business owners; craftsmen, retailers, artists, gurus; makers and movers of products, providers of a service; anyone who has mustered the courage and claimed the confidence to risk creating a customer. What is your potential? Have you ever slowed down enough to wonder what your future holds? Or are you too busy doing what matters right now, today? Potential is about tomorrow. And that makes thinking about it hard work. Potential is discovered, perhaps uncovered, over time. It’s what something (or what someone) can become because of, and sometimes in spite of, actual conditions. 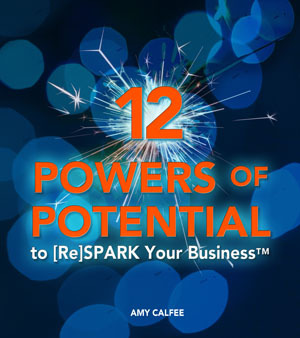 Potential needs a spark of desire to get started. Where there’s potential, the possibilities are [re]sparkable™. You have more power than you think. Within these pages, there are 12 powers to [re]fuel your journey; questions to [re]think your path and stories to [re]ignite your passion. These powers are [re]inforced by wisdom from people who have proven what’s possible and who believe in potential. I hope you find this collection of words and pictures to be a source of inspiration to walk, drive, fly, or ride your business closer to its potential.